10:51 p.m.: Bernie Sanders has won Colorado and opened up a small lead over Hillary Clinton in Minnesota. But was trailing her in Massachusetts, according to several media outlets. Meanwhile, results posted at Vermont Public Radio show Sanders beating Clinton 86 percent to 14 percent here in Vermont, with 76 percent of precincts reporting. Clinton needs to surpass 15 percent to receive any of Vermont’s 16 delegates. Sanders bested Clinton in every Vermont community that has submitted results so far. The Republican race in Vermont was still too close to call. Donald Trump held a one point edge over John Kasich. And, while they were a bit late on this one, our crack team in the Seven Days South Pacific Bureau can confirm reports that American Samoa, a group of small islands close to New Zealand, awarded six delegates to Hillary Clinton in its caucus today. The caucus was held in a hotel in the American territory’s largest city, Pago Pago. But you totally knew that already. 9:33 p.m.: Oklahoma, where Bernie scored a badly needed second victory today, has 38 delegates to Vermont's 16. Also, Seven Days obtained footage of a victory celebration in the Sooner State. 9:07 p.m.: Bernie may have had a big day in Vermont — he’s currently up 87-12 percent — but it’s getting ugly for him in other Super Tuesday states. Hillary Clinton has won in Alabama, Arkansas, Georgia, Tennessee, Texas and Virginia, according to the Associated Press. She is leading in Massachusetts. Early results have yet to trickle in from Minnesota and Colorado. Sanders did win Oklahoma, however. In a rally in Miami, Clinton made no mention of Sanders, and pivoted to a possible general election battle against Donald Trump. 8 p.m.: Democratic gubernatorial candidate Matt Dunne was beaming as he walked out of the expo. He had just spoken to the loudest, most raucous political crowd of his career. “It was amazing,” he said. Rep. Tim Jerman (D-Essex Junction), an uncommitted superdelegate as vice chair of the Vermont Democratic Party, departed the expo wearing a Sanders hat. Meanwhile, campaign manager Jeff Weaver signed a Sanders name tag for a volunteer. Everybody's a celebrity. 7:54 p.m.: With polls showing that Sanders may struggle in other states that offer much larger delegate troves today, he told the crowd he intends to keep campaigning. “At the end of tonight, 15 states will have voted, 35 states remain, and let me assure you that we are going to take our fight for economic justice, for social justice, for environmental sanity, for a world of peace, to every one of those states,” Sanders said. Bernie sings "This land is your land" with the band after speaking at his #supertuesday event in Essex. 7:39 p.m.: Sanders walked out to a cacophonous roar from a home-state crowd to declare victory in the Vermont primary. Sanders then launched into his stump speech, with a dash of local flavor. “In Vermont, billionaires do not buy town meetings, and in America we are going to end a corrupt campaign finance system,” Sanders said, with his wife Jane O'Meara Sanders, standing at his side. 7:20 p.m.: That didn’t take long. The Associated Press has called Vermont for Sanders. But there will still be drama in the vote counting tonight — Hillary Clinton needs to clear 15 percent of the Vermont vote to receive any delegates. Meanwhile, on the Republican side, Donald Trump and John Kasich are locked in a close race in Vermont, the Associated Press said. Clinton won Georgia and Virginia, several news outlets reported. Cheers sounded after each question. 6:40 p.m.: Sue Minter, a Democratic candidate for governor who announced last month she is supporting Sanders in the presidential race, took the stage. In the crowd, Sen. David Zuckerman (P/D-Chittenden) and Burlington Councilor Max Tracy (P-Ward 2) stood open-mouthed in surprise that Minter would be chosen to speak at Sanders' rally. “Let's keep the fire burning,” Minter told the crowd. 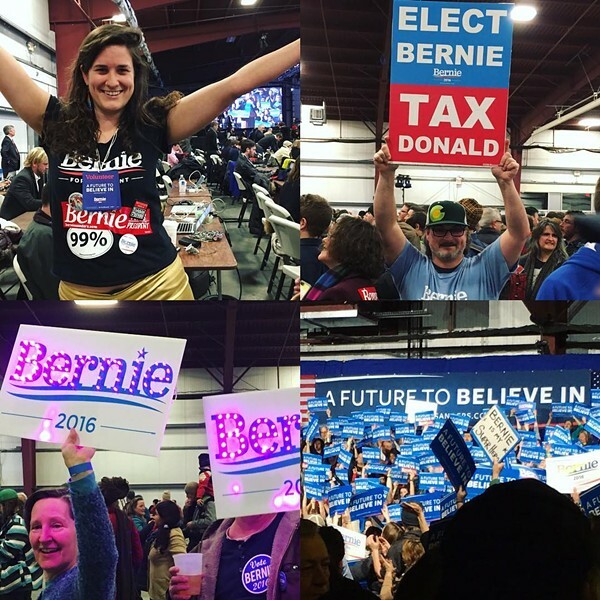 6:30 p.m.: The expo center floor space was nearly packed with Sanders supporters. Near the back, where there's more room, Dan and Libby Johnson of Richmond waited with 8-month-old daughter, Frances. They just moved from the Albany, N.Y., area and haven't registered to vote here yet, but wanted to hear Sanders speak for the first time. “I think he's ethical,” Dan Johnson said, hoping Frances would hold out long enough into the night so they could hear the candidate. 6 p.m.: After nearly a year of sharing the Bernie Sanders phenomenon with the rest of the country, Vermonters have him all to themselves tonight . 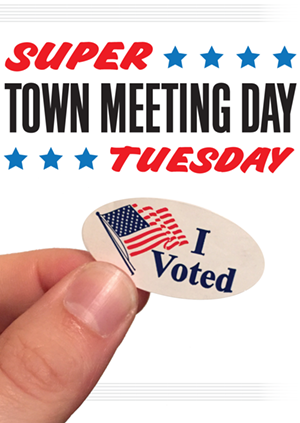 Vermont voters, whom recent polls show overwhelmingly favoring Sanders over Hillary Clinton in today's Super Tuesday primary, have one more hour to cast their ballots before polls close at 7 p.m.
Sanders and his team will be monitoring results from all 11 states voting in Democratic contests today. They'll be at the Champlain Valley Exposition in Essex Junction, which people have already packed for a rally and concert scheduled to last well into the night. Sanders started the day by casting a vote for himself at his polling place in the New North End. At the expo, which usually hosts soccer games on Tuesday nights, Bernie fans started lining up at the door before 3 p.m. By early evening, they began streaming in, waving their Sanders placards and proudly wearing their Sanders shirts. Vermont brands Fiddlehead, Green State and Citizen Cider are on tap. Expo executive director Tim Shea said the Sanders' campaign just contacted the expo Friday about renting the facility and things came together quickly. The venue can hold 5,000 people. Stay tuned to this blog, where we will be updating the election results — and the goings on in Essex all night.